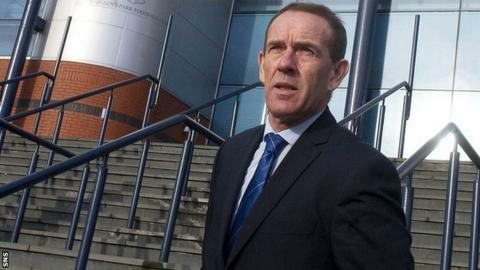 Kilmarnock manager Kenny Shiels has been given a touchline ban totalling four matches following the outcome of a Scottish FA disciplinary tribunal. Shiels was charged with two rule breaches for that led to the manager being sent to the stand. Dallas was fourth official when Shiels was dismissed during a match against St Johnstone in November. The SFA have applied a two-match ban plus a suspended two-match ban. Shiels served three matches in the stand following the incident on 24 November, with a two-match suspension for misconduct added to a previous suspended ban. However, speaking to BBC Scotland in December, Shiels said: "I brought in evidence to disprove the fourth official, who fabricated stuff to try and incriminate me. "I'm not going to lie down to these people. "The fabrication was outrageous - at least four different things that were said about me - but he wasn't aware I had visual evidence on my laptop." Dallas said he was "extremely surprised and disappointed by the comments and allegations made by Mr Kenny Shiels". The SFA subsequently charged Shiels with "[m]aking comments in media interviews that impinged upon the character of a match official" and "[n]ot acting in the best interest of Association Football by making improper comments of an insulting nature in media interviews". And the governing body say 56-year-old Shiels has five working days to lodge an appeal against the ruling.